Surely one of the most beautiful and exotic of all flowers is the lotus. There are two species, nelumbo lutea (the American lotus) and nelumbo nucifera (the Asian lotus). The Asian lotus is native to a huge area from India to China, including northern Australia. The huge leaves, like giant nasturtium leaves, are borne on strong, thick stems that rise up to a metre above the water. They settle and rest on the water after a few days. The gorgeous plump buds emerge on long, straight stems, rising above the leaves before opening to reveal the exquisite flower. The perfectly arranged petals open each morning and close in the evening. The centre, or heart of the flower, is a disk-shaped cone that holds the seeds. When the petals fall, this centre hardens and the seeds form, so the spent flower remains very attractive in its own right. Lotus blossoms are in shades of white, yellow, pink and red. Bees love foraging in the flowers. The lotus is an aquatic perennial, active throughout summer and completely dormant in winter. The roots and rhizomes grow in the mud at the bottom of a pond, river or lake, but if you don't have one, a large bowl or pot will do perfectly well. Lotuses will grow in full sun to part shade. They have vigorous running rhizomes, so they need a wide container and about 15-20cm of soil. I prefer to grow my lotus directly in the bottom of large water bowls, although you can just place a plastic container containing the plant in the bottom of a water bowl if you prefer. A layer of gravel on top of the soil helps keep the water clean. You can add some native fish to deal with mosquito larvae. 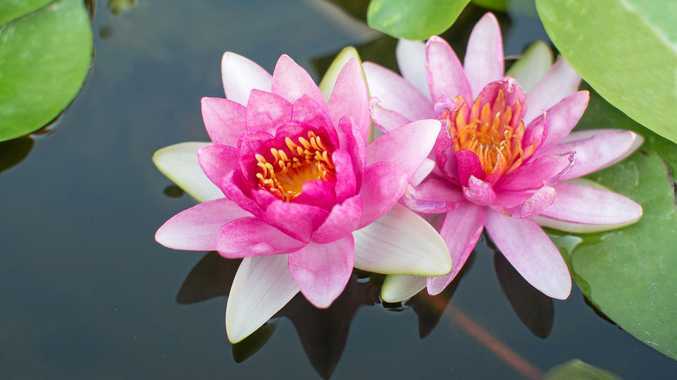 Lotuses are vigorous growers and heavy feeders, and need to be fertilised every 4-6 weeks during the growing season with water plant food tablets. Even though they are dormant for 3-4 months of the year, I still think lotuses are one of the most rewarding - and easiest - plants to grow.